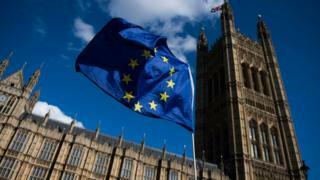 The EU Withdrawal Bill may not now be discussed in the House of Commons until after the Autumn recess, sources have told the BBC. The law is designed to transfer EU law into UK law ahead of Brexit. It is facing stiff resistance from some Tory rebels as well as from the opposition parties. One official source said it was not yet back in the house of Commons because there simply "is not enough political agreement yet". MPs return from Autumn recess on 13 November. The government said the bill was not being delayed because a date had never been set. But BBC political editor Laura Kuenssberg said the expectation in Whitehall had been that the bill would be back in the House of Commons straight after the party conference season if the government was to have any chance of getting it through Parliament by the Spring. The decision to not bring it back until at least the middle of November makes it less likely ministers will be able to push it through on time, she added. The UK is due to leave the EU in March 2019, and the bill seeks to transfer European laws into UK laws and avoid a legislative "black hole" on Brexit day. But critics have described it as a "power grab" by the government. The draft legislation, formerly known as the Great Repeal Bill, has already passed its second reading, and is now facing several attempts to amend it at the next part of its Parliamentary journey, the committee stage. Last week Commons Leader Andrea Leadsom told MPs there had been "300 amendments and 54 new clauses" proposed and that it was "taking a bit of time to have proper, thoughtful, well-considered responses". Speaking on the BBC's Daily Politics, Brexit Minister Robin Walker said the Commons would be debating it "within weeks" and that it would offer "continuity and certainty" as the UK leaves the EU. But Labour's Brexit spokesman Sir Keir Starmer said: "This is further proof that the government's Brexit strategy is in paralysis. "The negotiations are in deadlock and now a crucial piece of legislation is facing further delay."